Even when viewing the results on the back of the camera I knew that the Fuji X100S was capturing the landscape as I was seeing it. 1/1000 @ f8, ISO 400. Much has been written about the Fuji X100S and its capabilities as a street camera and the look and feel of this camera certainly evokes thoughts of roaming the streets in search of light and subjects. And I've previously written on this blog about getting back into street photography and how I too thought this was the perfect camera. 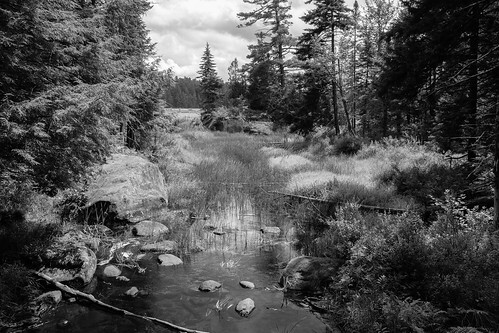 What is overlooked though is that the quality of the images produced by this camera make it ideal for just about any type of photography, and that includes landscapes as I recently found out after spending a week hiking in the high peaks region of the Adirondacks. This camera excels in black and white mode. I have added a custom setting for black and white so that I can quickly transition when the mood strikes me. 1/550 @ f8, ISO 400. For this trip I was prepared to take my DSLR, assorted lenses and tripod. But the more I thought about that, it became clear that this trip was more about getting away and while I enjoy taking photos outside work, I didn't want to put the pressure on myself that sometimes comes when I bring all my gear. And after all, one of the reasons I decided to purchase the X100S after reviewing it for ten days was because the quality rivaled my DSLRs. 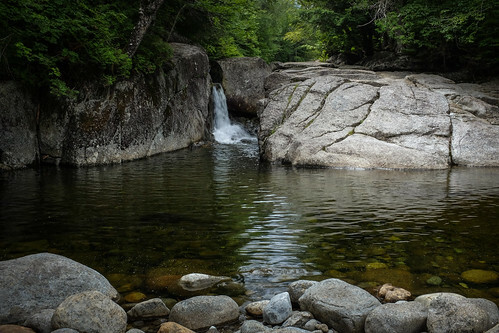 Rocky Falls is a two mile hike from the Adirondack Loj. Hand holding the X100S was easy even with a slow shutter speed in order to add motion to the water falls. 1/25 @ f16, ISO 200. Because of the size and weight, I was able to carry this camera over my shoulder while hiking and by running the camera strap through a carabiner attached to my backpack harness, I did not have to worry about the camera hitting the ground if it happened to slip off. Another reason it stayed on my shoulder is that I replaced the manufacturers strap with a double-sided non-slip strap from Think Tank Photo. Panoramic view of Heron Marsh located at the Paul Smith's College Visitor Interpretive Center. I'm sure this would be spectacular with early morning or late afternoon light, but the X100S did just fine at noon. 1/850 @ f8, ISO 400. This was also the first opportunity I had to really use the panoramic settings on the camera and was impressed with the results. The features are not much different than other cameras, but the setting is easy to get to quickly and understand. You decide camera orientation and direction of the pan, along with how many degrees you want to cover. Once set, you pick the starting point, press the shutter and the camera provides visual cues needed to maintain the correct speed as you complete the pan. 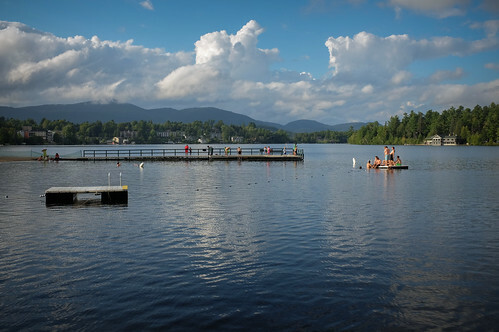 The early evening light highlights swimmers at the public beach on Lake Mirror located in Lake Placid, N.Y. 1/300 @ f8, ISO 200. Something else that really impressed me was that almost all of these photographs were made between 10 a.m. and 3 p.m., normally not the best time to photograph landscapes. So what did I do to make up for the lack of golden hour light? Well not much, but nature did help by providing cool crisp air, nice big clouds and plus I underexposed most shots by a third to one full stop. This helped deepen the colors, eliminate bright spots and add some contrast. 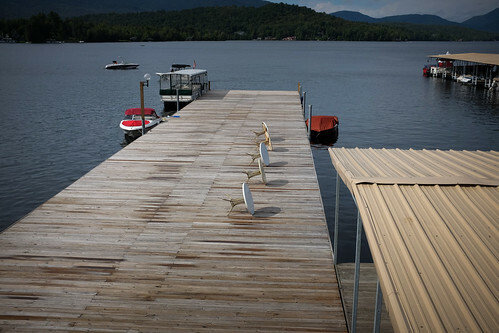 Lake Placid, N.Y. 1/1100 @ f8, ISO 200. 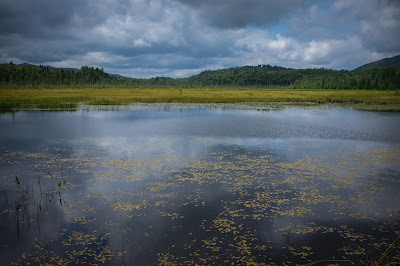 All of these photos did pass through Adobe Lightroom 4, however only minimum corrections were applied. The results straight out of this camera are so close to perfect, post production is a breeze. So while I don't think the Fuji X100S will replace my DSLR camera for all my landscape photography, it was an attractive alternative knowing I had miles to hike and was looking to shed some pounds. I think the results speak for themselves.